Facebook will replace online display advertising as we know it. It will save digital media by reversing the commodity pricing trend. And it will become the highest grossing media property in history. Believe me? If you’re one of the investors who was burned by Facebook’s disappointing IPO, you might not be so bullish. At a multiple of 28X last year’s earnings, Facebook’s offering price presumed fast-growing and scalable revenue streams. But the reality of Facebook’s advertising trajectory has been lagging, and continued percentage growth isn’t going to make it up. Facebook needs a huge discontinuity in its advertising revenues to make that math go round. Fortunately, I think we’re about to see a huge discontinuity. Facebook’s great opportunity is to create an advertising product that the world has never seen. And it can be done. The key is in a single idea, and Facebook is singularly able to deliver on it: SELL RELATIONSHIPS, NOT IMPRESSIONS. The first 100 years of brand advertising was built on the paradigm of a captive audience with interruption advertising in TV, radio, print, and online. That created a $540 billion market to reach a mostly-right audience at the mostly-right time, with a sometimes-right message delivered via occasionally-great creative. The basic idea being that if you reach those people with enough frequency and decent creative, they’ll eventually hear your message. But never, ever, ever has any brand had an advertising platform that could create a relationship with a consumer before she makes a purchase. The ability to sell relationships puts Facebook in a completely different business than every other media company – and their product is orders of magnitude more valuable. To undermine that premium would be absolute folly. That’s why Facebook should never, ever sell impressions. Facebook has the commodities of digital media in abundance: 900 million users, 1 in 7 minutes of our online attention, and 500 billion pageviews per month. But they won’t – and shouldn’t – open the banner ad floodgates, because they saw this movie back in 2007: MySpace flooded the market with banner ad inventory and watched their value plummet to pennies per thousand views. There’s no scarcity of ways to reach a target demographic with a banner ad, and anything remotely similar to a banner ad will be price-compared to a banner ad. Back when she was at Google, Sheryl Sandberg designed AdWords and AdSense to do something nobody had ever done before at scale: form a direct link between the cost and value of an ad. She had pretty good results – today Google owns more than 60% of the market for direct response advertising. Now that she’s with Facebook, Sheryl knows better than to fight Google for the same pie – especially when Facebook’s opportunity is so much larger. As a medium of connection rather than transaction, social is perfectly suited to brand advertising. And the market for brand advertising happens to be 9 times the size of the direct response advertising universe that Google has increasingly dominated. 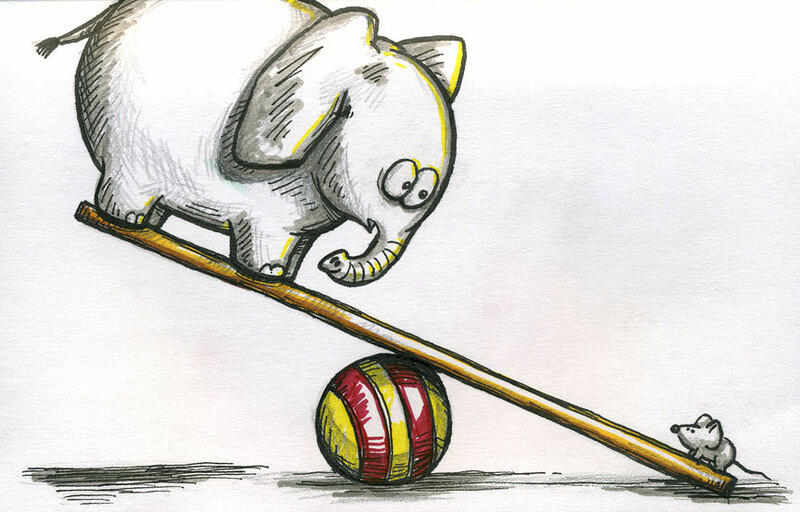 What’s more, advertisers have been pent up, waiting to invest in brand advertising on the web. To date, they’ve allocated only 40% of their online ad spend to branding, even though more broadly brand advertising garners 90%. As a relationship broker, Facebook is the one who can convince them to spend. Just as Google proved the value of direct marketing online, Facebook can prove that brand relationships can be built more effectively on social media than through any magazine spread. The holy grail of media is advertising that actually adds to the value of the content. You can see it today in the print editions of magazines like GQ and Vogue – the advertising spreads are so gorgeous and smart that readers think of them as content. Facebook is poised for this challenge. Zuckerberg has always put the user experience forever ahead of revenue today. He knows better than to devalue the audience’s experience with advertising products that serve advertisers while frustrating users. No doubt advertisers – not to mention Wall Street investors – will continue to be annoyed by their second-class status in the short term, but Facebook’s unyielding focus on user experience will serve all their constituencies well in the end. Facebook’s greatest competitive advantage is the incomparably rich dataset it owns about each and every one of its 900 million users. That data is scarce and tremendously valuable for targeting – which means that Facebook will be able to charge a premium for every advertising offering it puts forth using it. Much to the chagrin of advertisers and publishers alike, there is overwhelming strategic value in keeping that data limited rather than selling it wholesale. Facebook will never give advertisers the data. They could sell access to the list of people predisposed to buy your product, or they could make all user data available and let anyone analyze it. The former preserves scarcity and the other destroys it. And that’s also why Facebook will lend its data sparingly. Even in the most recent FBX announcement (an enhancement to its least valuable form of advertising), Facebook kept their own dataset out of it completely, allowing use of third-party data only. When it comes time to sell, or more realistically, lease, that data, Facebook will do it with tight controls and at a huge premium. Remember: the media industry was once robust and profitable. What was different then? The targets were the same, but the ways to reach them were fewer. If Facebook plays by the four rules above, they will create the killer ad offering that will finally bring the big brand advertising dollars online. But Facebook ads on Facebook will be only the beginning. Just a few days ago, Facebook took its first step in the direction of the bigger opportunity: extending those services to other publishers on the web. I’m not talking about AdSense – I’m talking about creating a far more intelligent programmatic relationship between users, their interests, and branded content. Every publisher would be better off if they were using Facebook’s comprehensive and lifelong relationship with users to inform their advertising – and if they themselves had a way to sell relationships, not impressions. Ultimately, exporting the offering to the rest of the web (86% of user attention is spent elsewhere, after all) will send more value right back to Facebook in the form of a larger dataset. Not to mention a nice cut of the revenues that Facebook would be entitled to. This is a huge opportunity for the entire digital media industry. Online advertising has become a commodity (thanks, Google!). Facebook is digital media’s one best hope to reverse that trend and make online advertising more valuable than offline advertising by tenfold. Google took direct marketing and made it extremely efficient, allowing advertisers to spend less. Facebook has something to sell that might actually make advertisers open their wallets more: a magic brand relationship machine that far exceeds the value of transactional clicks. Wall Street would much rather that Facebook ignored the five rules above, because Wall Street wants profits now. Facebook wants profits forever. May the latter prevail. This article was published as a guest post at Business Insider, and is republished here for Digital Quarters readers. We spend more time on Facebook than anywhere else on the web. Out of every seven minutes online, one of those minutes is spent on Facebook. Second place Google captures only one in ten – and that’s including YouTube! But you wouldn’t know it from looking at the way advertisers allocate their money. Globally, advertisers spent $36 billion with Google in 2011. They threw $4 billion at Yahoo (which captures 8% of our web time). But for Facebook? $3 billion and change. Facebook garners only 4% of internet advertising spend when they’re capturing 14% of our online attention. 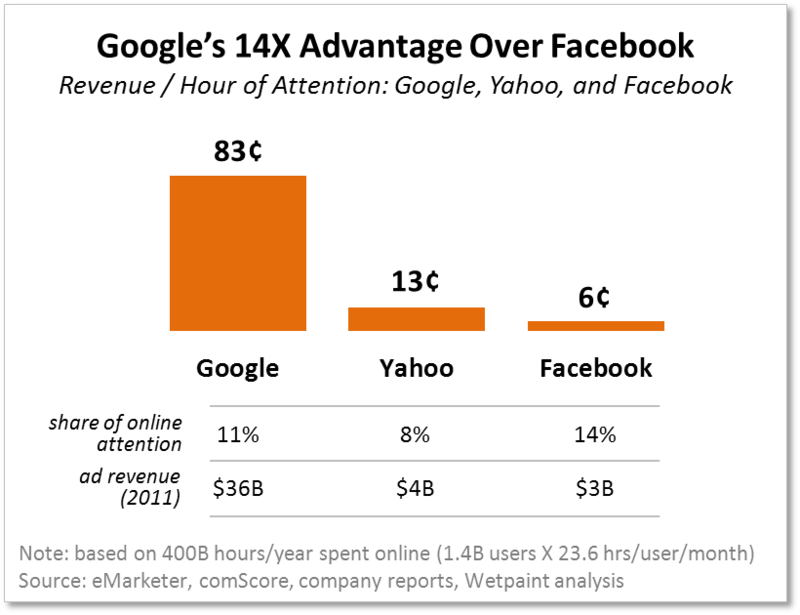 And the discrepancy deepens when we look at online and offline combined: because advertisers haven’t shifted money to digital as quickly as we’ve shifted our attention, Facebook gets shortchanged even more (by 7x, to be exact) in the big picture. 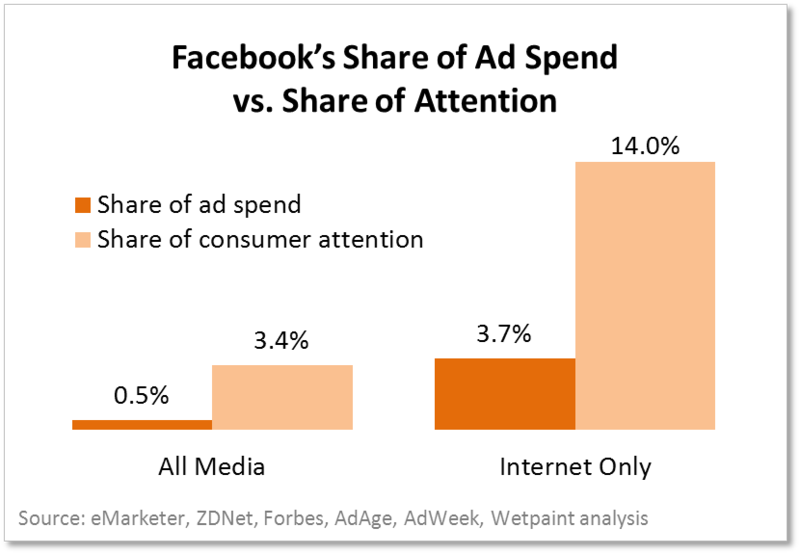 What would Facebook revenues look like if brands matched ad spending to consumer attention? 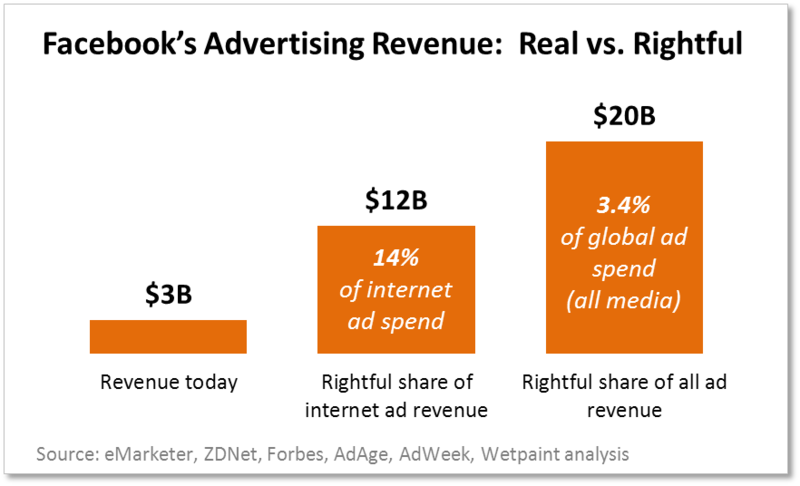 The revenues in the chart above hypothecate only that Facebook gets “back to even” with other forms of advertising. But Facebook has an asset no other brand advertising vehicle has: a treasure trove of targeting data. Facebook’s greatest business opportunity is to use that targeting data to sell relationships, not impressions. And if it can do that, then it may be able to achieve even more than “average” pricing. And it could deserve it – if it can offer relationships with consumers that are worth exponentially more than a magazine spread or a keyword ad on Google. Larry Page, are you sweating yet? This article was published as a guest post at TechCrunch, and is republished here for Digital Quarters readers. Bing and Google each recently unveiled its own new search interface, designed to better intuit your intent and help you get to the one best answer more efficiently. And they’ve made it ever more clear that search is heading straight for a merger with social. The changes are smart. Google’s knowledge graph is useful – when I search for certain things, I just want a cheat sheet. What is Faraday’s Law, again? What exactly is a geoduck? But Bing’s new feature – “people who might know” – is even smarter. This is the first major attempt at a merger of search and social – unless you count Search Plus Your World, which I don’t – and this is undeniably the way we’re headed. There’s a lot of information on the internet, but getting the right info from the right person is still a huge, and mostly unsolved, undertaking. Nobody knows the answers better than, well, somebody who knows the answers. And so much the better if it’s someone I trust. (Thank you, Jeff, for the Singapore recommendations!) The fundamental insight is that when I ask a question, there are lots of ways to help me find the best answer. If you don’t have it, point me in the direction of someone who does. Don’t make me ask the same question in a million permutations and sift through a list of 20 possible right answers every time. What’s more interesting is that this is the biggest step forward we’ve seen since search results started looking 12 years ago the way they still do today (just with more images and toolbars now – exactly what Google got rid of back then!). What’s the endgame? In 10 years, I’ll still need recipes for dinner. And recommendations for hotels in a new vacation spot. And to find something to do on the weekend. I know how I would make these decisions today, but how will I make them in 2022? Proactive: It’s Tuesday night and I’m hungry. Luckily, my mobile knows that I just got a CSA box containing sweet potatoes (Full Circle Farm’s Facebook integration), and that I tend to eat at home on Tuesdays (according to my historical pattern of check-ins). It also knows that it’s cold and raining outside. Before I’ve gotten around to opening a cookbook or the Epicurious app, my mobile pushes me a sweet potato soup recipe that my certified-foodie friend raved about on Facebook last week. Personal: Arrive at the Sao Paulo airport and search on my mobile for the city’s public transit map. My device knows that I’ve never been there (even though I bought a phrase book on Amazon last week), and it also knows (from scanning TripAdvisor comments about Sao Paulo buses) that the public transit is impossible to navigate for newcomers. While the map is loading, a message appears gently encouraging me to consider a rental car instead – there happens to be a great deal on an Audi (my favorite(!) as noted on Facebook) at the rental counter 10 feet away. Talk about targeting! Social: Florence and the Machine is touring in New York, and I’m dying to go see them. I called the usual suspects, and they’re out of town during the concert. The only thing worse than not going is going alone. But who else do I know who loves them like I do? That’s a lay-up for a socially powered search if ever there was one. Two words: “Jason Hirschhorn”. Is that so hard? Most of us don’t have personal assistants. But we have left a heck of a trail of our interests, associates, habits, and dislikes. It will take some algorithm to turn that trail of behavioral and social data – combined with the wisdom of topical experts and the vast repository of information that is the internet – into a set of smart, personalized answers for you and me. But that’s why Google and Facebook and Apple hire engineers with such big brains. And, surprise!, the better they understand our brains (read: intent, context, and relationships) the better the match they can serve up to an advertiser. And that means an outrageously good search not only retains audience better, but would improve ad rates. We’re on the verge of shifting from a search model in which the user is still doing all of the heavy lifting to one where powerful algorithms enable our devices to anticipate our needs and do most of the sifting and evaluating for us. In the meantime, though, we’re stuck in a “hairball of complexity” (to borrow Adam Richardson’s TV industry analogy) while the industry struggles to find the way from A to B. The key is in having software that recognizes us as whole people. (And isn’t that exactly the promise of social?) Now search is undergoing a massive transformation from receiving input in the form of queries – each independent and atomic – to understanding its input in the form of people, who have personal history, context, and relationships. That means delivering the right result depends on who is asking. Which is sooooo true. I don’t like the same music as my teenage niece, and she doesn’t like the same restaurants I do. Why should we both get the same search results? Apple’s Siri is certainly the closest, at least in spirit, to the eventual reincarnation of search as personal assistant, even as its true capability has far to go. The voice-activated question-and-answer experience is light years ahead of the long list of links on a page that still defines search on Google and Bing. But the trick that remains is to gather, combine and analyze data from myriad sources – social interactions, behavioral data, expert opinions – and deliver it back to the user in a way that makes decision-making more efficient than most of us can imagine. With all of that time I used to spend inefficiently making decisions suddenly freed up, what will I do? I’ve been meaning to plan a trip to Sao Paulo….